NEW YORK, New York — Armenia Fund is implementing a major renovation of the community school of Artsni, a village in Armenia’s Lori Region, with financing provided by the government of India. The project entails the reconstruction of one of the two main buildings of the two-story school, which was built in 1962. At the conclusion of the initiative, the renovated school will accommodate all of Artsni’s students — who at present total 49 children. To date the building’s roof as well as doors and windows have been replaced, along with an added boiler room. Currently construction crews are preparing to install new hardwood floors and paint the walls. Marieta Arustamyan, principal of the school, conveying her profound gratitude to the Indian government, said that the campus had long been in a state of disrepair, adversely affecting the quality of learning. She went on to express her confidence that the renovated school will boost student morale and lead to educational excellence. “Today our residents are filled with renewed hope at the sight of construction activity in the village, even though many of the issues we face as a community still need to be addressed,” said proud Artsni Mayor, Khenko Khachanesyan. “India’s contribution to the reconstruction of the school of the Lori Region’s Artsni community is part of India’s Development Assistance Programme for friendly states such as Armenia, and reflects the desire on the part of India to be a willing and reliable partner in their developmental efforts, beginning with projects of high priority,” said Achal Kumar Malhotra, Ambassador of India to Armenia. “We are confident that, once reconstructed, the school premises will provide an ideal environment for education,” Mr. Malhotra concluded. ABOUT ARMENIA FUND USA: founded in 1992, was one of the first of Hayastan All-Armenian Fund’s 16 international affiliates and serves constituents in all states east of the Mississippi. As a non-profit, non-governmental, nonsectarian organization, the Fund represents all Armenian constituents. 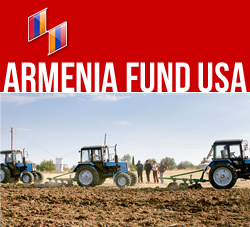 Armenia Fund USA is the largest contributor among the 16 international affiliates – supporting strategic infrastructure projects in Armenia and Karabakh. The Fund has adopted a policy to go “Beyond Bricks and Mortar” to provide sustainability for projects it sponsors.